Many different sectors of modern society influence the nation's healthcare system. Government, health insurance companies, managed care organizations, academic health centers, the pharmaceutical industry, and other groups all affect healthcare. In the areas of medical access, cost, and quality, the physician remains the key to the efficiency and effectiveness of healthcare services. 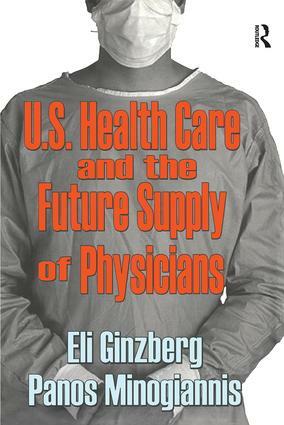 Eli Ginzberg and Panos Minogiannis, in Ginzberg's final book, examine the supply of health personnel in the United States. They consider the ways it has been influenced by federal and state legislation, healthcare financing, the transformation of the hospital, managed care, and health trends in the last part of the twentieth century. Through this historical approach, the book identifies key moments in U.S. health policy history that have led to problems in the geographical distribution of medical personnel, gender and race representation in the health personnel pool, and subsequent attempts to resolve these problems. This volume pays special attention to current trends in healthcare and tries to forecast the direction of the debate over health personnel supply in the coming years. Chronic care conditions and the ageing of the population on the one hand and the penetration of managed care and the subsequent transformation of American hospitals on the other converge to present policymakers with tremendous challenges in financing healthcare. Ginzberg and Minogiannis argue that a more balanced production and distribution of U.S. health personnel will go far in easing the financial burden of healthcare and at the same time improve the quality of services provided to the American people.